Each one of my children has posed different challenges when it comes to sleep. Whilst I thought that I had a tough time with Roo, it was only when Tigger came along that I realised that she was a dream. Tigger opted to wake at least once an hour, every hour for around two years. Just requiring that reassurance that someone was there before drifting back off to sleep. Piglet has been completing different to her siblings. From almost day one she has wanted to sleep on her side. With the comfort and support from the side of the crib, she’d never settle in the middle of the crib so always had to be leaned up against the side. This is one of the reasons she was still sleeping in her crib at 10 months old as she did not like the open space within her cot. Having to transfer her to the cot wasn’t easy as she would bash against the bars which woke her. Nowadays, I still go in to find her laying sideways in the cot against either the top or bottom headboard as this provides the security she seeks for comfort. Sleepyhead of Sweden recently contacted me to see whether I would like to try out their Sleepyhead Grand model to aid Piglet’s sleeping. At first, I assumed that she would be too old for it as I thought that these were only for smaller babies. However, I was completely wrong. The Sleepyhead Grand model is aimed at babies/toddlers aged 8-36 months and can be used in a variety of different ways. Unpacking the Sleepyhead Grand is a quick and easy job, that takes just a few minutes. In fact, it took me longer to get into the delivery box than it did to set up. Packaged in a clear carry case which ensures that it arrived in pristine condition, plus can be placed back in there when transporting on holiday or to relatives houses. Assembling the Sleepyhead is a simple case of removing one tag and the cardboard insert from the bottom segment of the sleeping pod. Then simply place within the crib, cot or bed and you are ready to go. 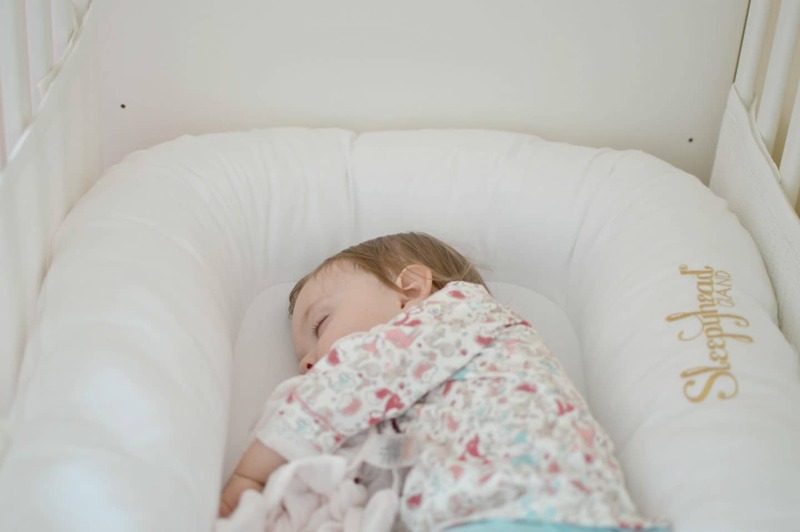 Although I had seen photos of the Sleepyhead Grand online I wasn’t aware that the base of the sleeping pod was padded and provides that extra level of comfort for little ones. Available in a range of different covers which can be easily removed and washed or exchanged if you fancy changing the look of the Sleepyhead from time to time. 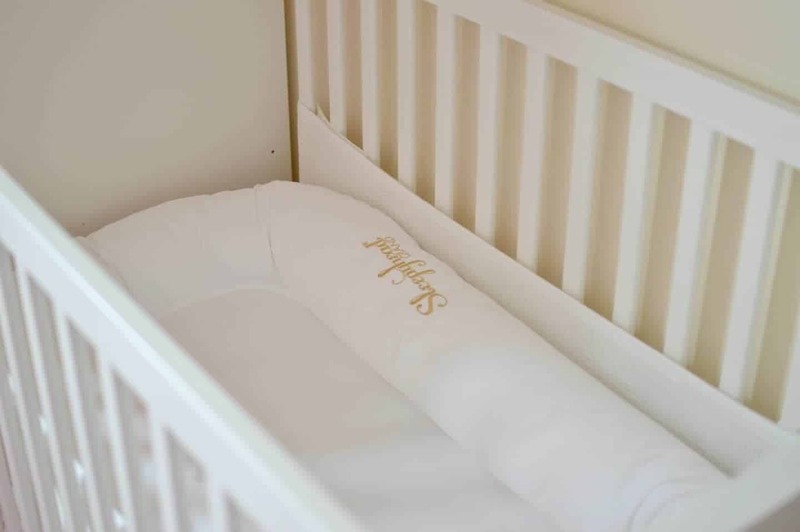 As we still haven’t decided on a theme for Piglet’s nursery the pristine white Sleepyhead Grand looks simple and stylish against the current neutral backdrop. It will also tie-in to future renovations of her room. The versatility of the Sleepyhead Grand has really come into its own this past week or so as Piglet has been under the weather. Generally speaking, she will only ever fall asleep in her cot, the car or whilst being cuddled. However, this isn’t always practical, especially when she is running a fever. The Sleepyhead Grand has allowed me to place this on the floor in the front room and let her get the much-needed rest. With me being on hand for when she wakes and requires a reassuring hug. Whilst she isn’t quite at the stage of lounging watching movies etc, I can see that this well be something that we will use the Sleepyhead Grand for in the future. Although I think I’m most excited about placing it inside travel cots as we head off on family travels this summer. I’ll be honest and confess that I dread how Piglet will sleep on holiday. Travel cots are the most comfortable places to sleep anyway. So I have high hopes that this will make our adventures easier and that she well sleep safe and sound in the comfort of her Sleepyhead Grand.